The 2010 Diwali season will soon be upon us and many companies are searching for the perfect gifts to thank their hardworking employees, while still keeping an eye on the all important bottom line. Exalon Promotion is the perfect place for corporate gift orders, due to their volume discounts; monogramming, screen printing, and embroidery capabilities; practice of providing samples upon request; and wide selection of quality products for business personnel, with pricing to fit the budget. 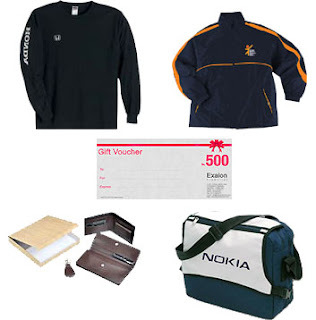 Top companies that have already chosen Exalon Promotion for their corporate diwali gifting includes Sony, Virgin Mobile, Vodafone, Aviva, Aircel, Shell, UB Group, Nokia and more. Remember personalizing with monogramming and engraving can make all the difference! Contact Exalon Promotion today!! !